The Value Of Building Material.. Architecture should not only look good, but it should make us feel good, too, as it can undoubtedly impact our wellbeing and quality of life. Sunshine and fresh air, beyond affecting light levels and temperature, are energising and uplifting with the potential to influence our energy levels and mood. Open-plan living can encourage and support interactions and foster positive relationships, while flexible and zoned spaces cater for the changing dynamics of growing families. 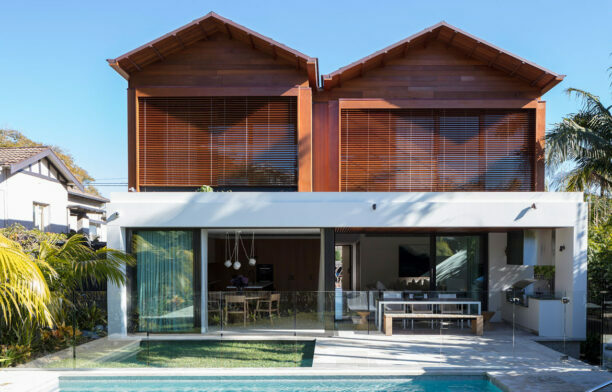 Having visited Brazil, the clients had a great appreciation for Marcio Kogan’s architecture, particularly his rectilinear volumes wrapped with timber screens, and they took examples of his work to Madeleine. 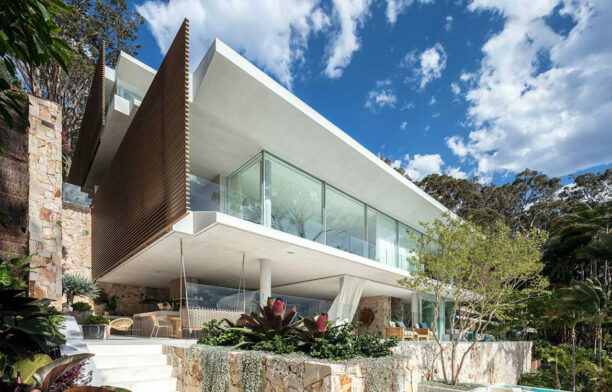 “Kogan’s houses are usually out in the open or surrounded by jungle, rather than neighbours, so our design was about creating that expansive feeling without large cantilevered concrete forms,” says Madeleine. The house sits on a long and narrow north-south site with neighbouring houses backing on to the eastern side. It’s arranged with living areas downstairs and bedrooms upstairs. Two walkways are stacked on top of each other through the centre of the house and courtyards carved out either side. 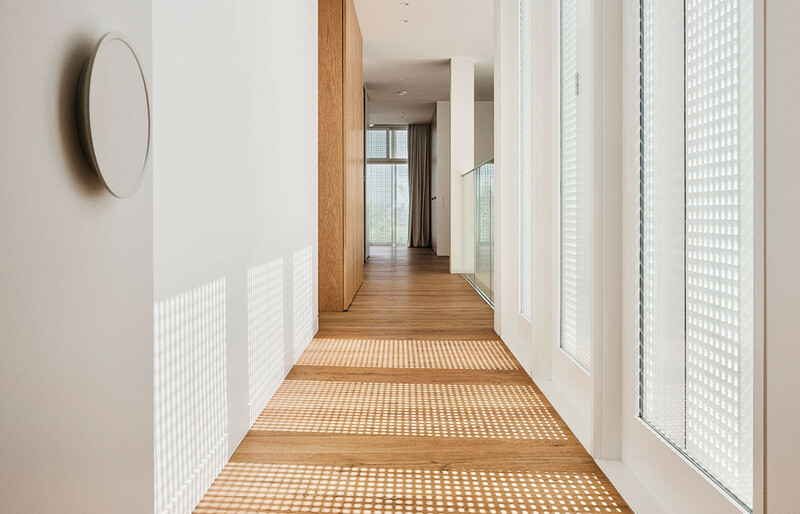 This allows eastern and northern sunlight to filter through the sheltered courtyard into the living spaces and keeps windows to the north and south. The downstairs walkway extends from the front door to back garden and offers a portal view of the ocean. The corridor is lined with timber joinery providing storage and concealing access to the guest bedroom and children’s rumpus room. 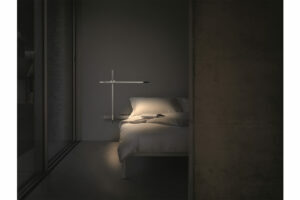 Both are designed to capture sunlight: the guest bedroom with a raked ceiling and the rumpus room with a void above. 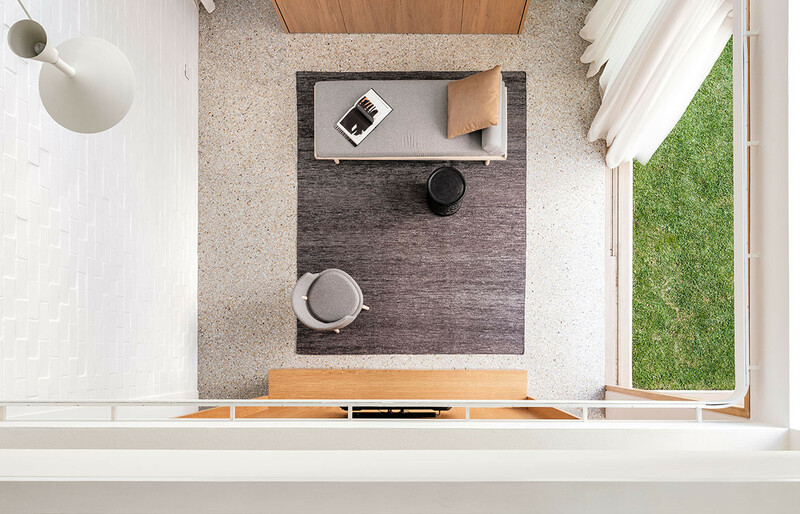 Passing the courtyard, the walkway steps down into the kitchen, living and dining area while the ceiling level remains the same, creating a room with more than 3.5 metres in height. 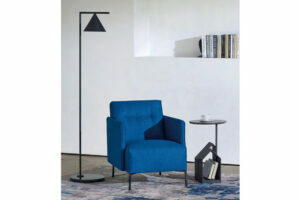 “As the rooms become larger they also gain more volume,” says Madeleine. High-level windows wrap around the room, enhancing the sense of loftiness. Views of the sky contribute to its calming atmosphere. The living area extends outside, and a stone wall protects the back garden and swimming pool from the strong southerly winds. 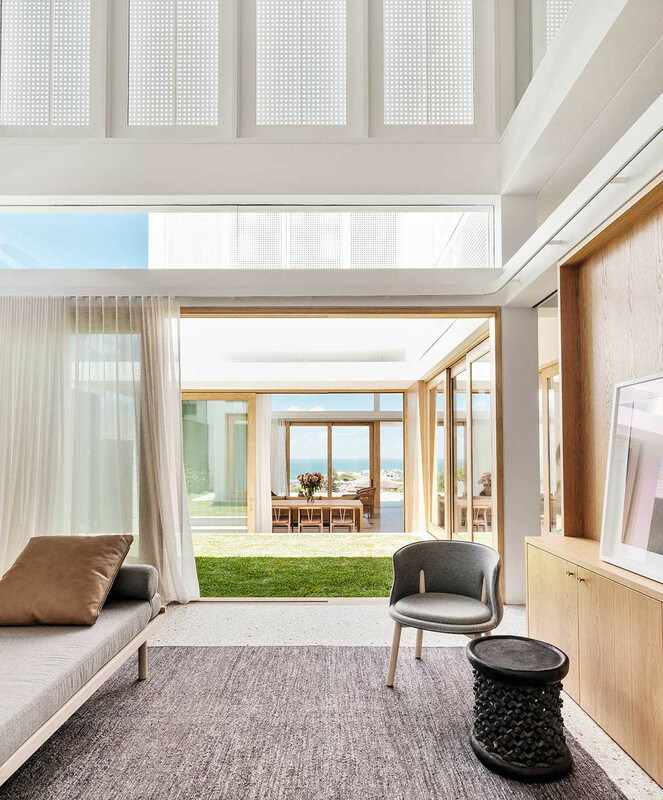 Large sliding glass doors open the living area, rumpus room and walkway to the outdoor spaces, maintaining a visual, acoustic and physical connection between spaces while still providing a sense of separation. The stairs, laid with Mafi timber flooring, open to a study area and passageway overlooking the rumpus room, the void providing a link between the two floors. The master bedroom and ensuite at the end of the corridor offer panoramic views. “Bathrooms are one place you are sure to spend time every morning and night. They should be an uplifting experience, not shoved in the back corner,” says Madeleine. 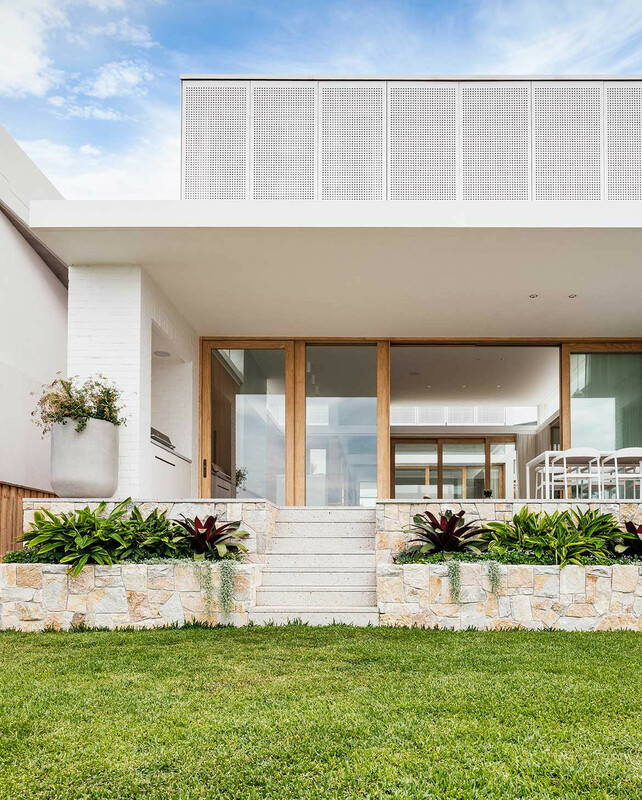 To maintain privacy, the upstairs exterior is wrapped with perforated white Equitone screens, reminiscent of Kogan’s architecture. 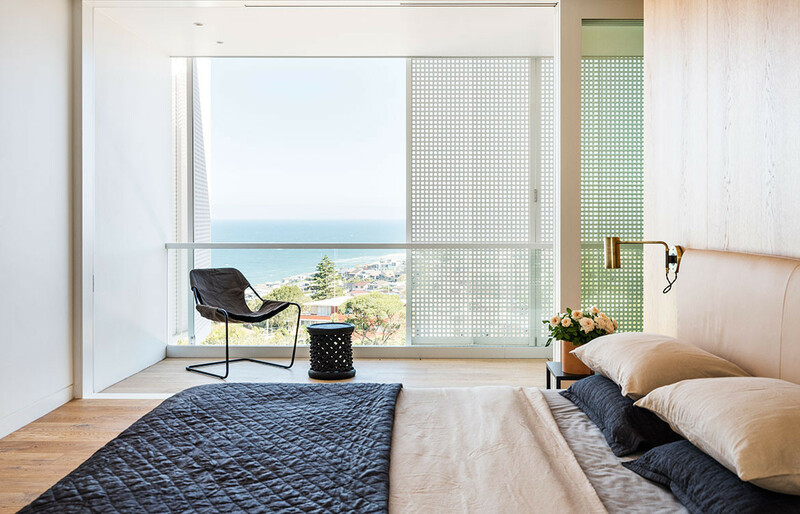 Concealing bedrooms when closed and opening for views and ventilation, they provide a soft ambience and cast patterns of light across the engineered timber floors. Like much of the material palette, the screens required experimentation and determination to achieve the desired outcome. Only so much could be removed without losing stability. Likewise, the garage door took trialling to create a lightweight structure using timber battens and an aluminium frame. 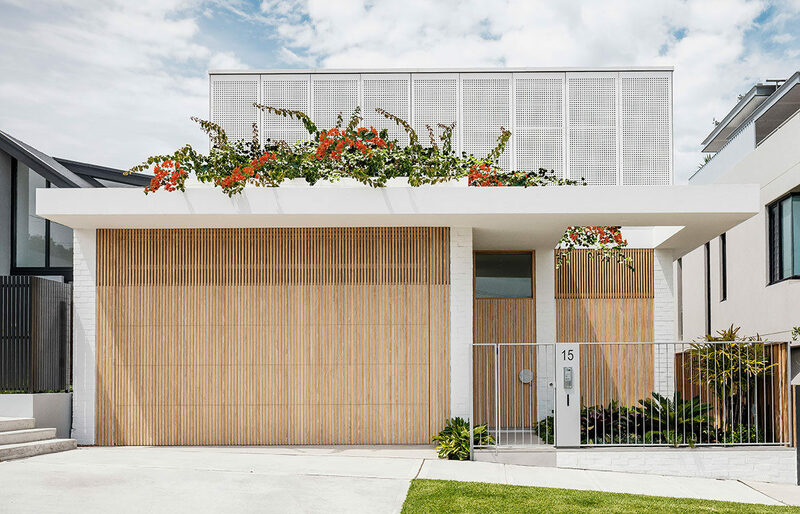 The effect integrates the garage with the house – the front door also being timber – similarly evoking Kogan’s timber screens, though in a different manner to the perforated panels. 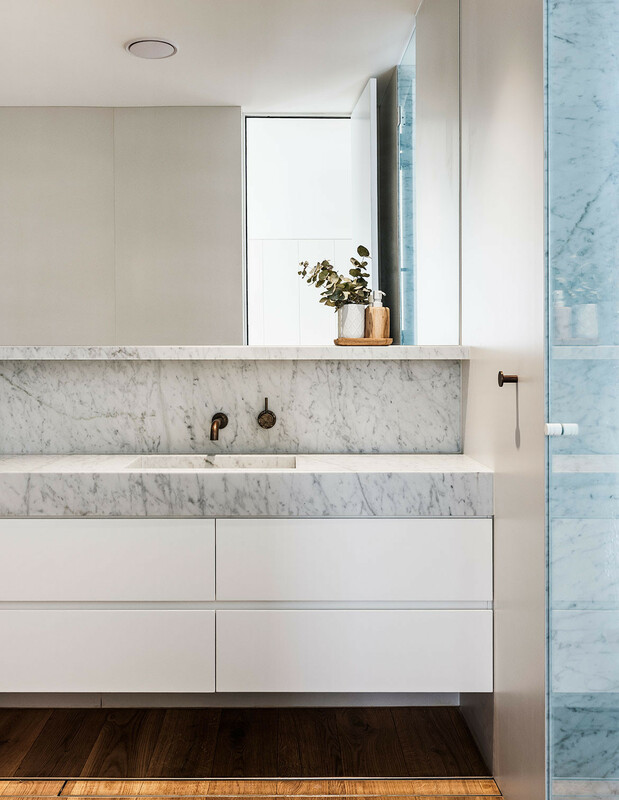 Madeleine and the clients worked closely with stone company Skheme for the flooring, kitchen and bathrooms to push the boundaries of what is typically feasible. 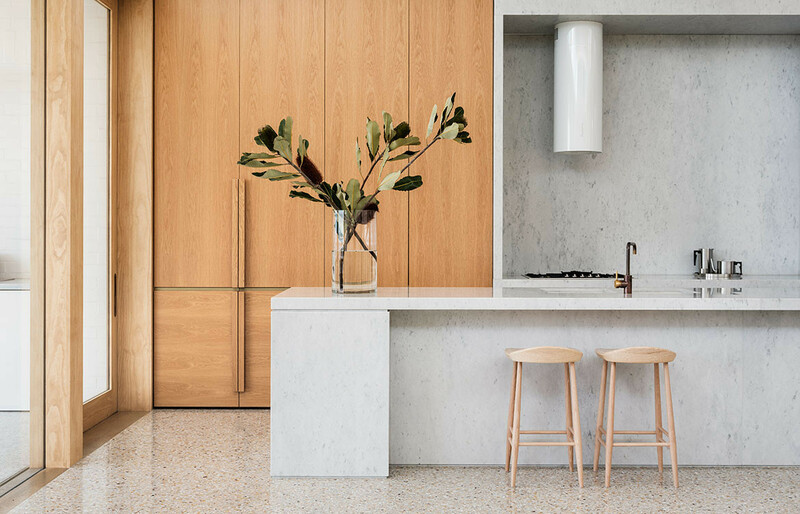 The kitchen is clad with Carrara marble with mitred edges, while a streel frame required to support the back wall and the downstairs floor, both inside and out, is laid with 1.5-square-metre Terrazzo tiles custom made in Italy. The tiles incorporate Carrara marble to complement the kitchen, and gold-coloured chips bring in the colour and warmth of the timber joinery and stained Accoya wood door frames. 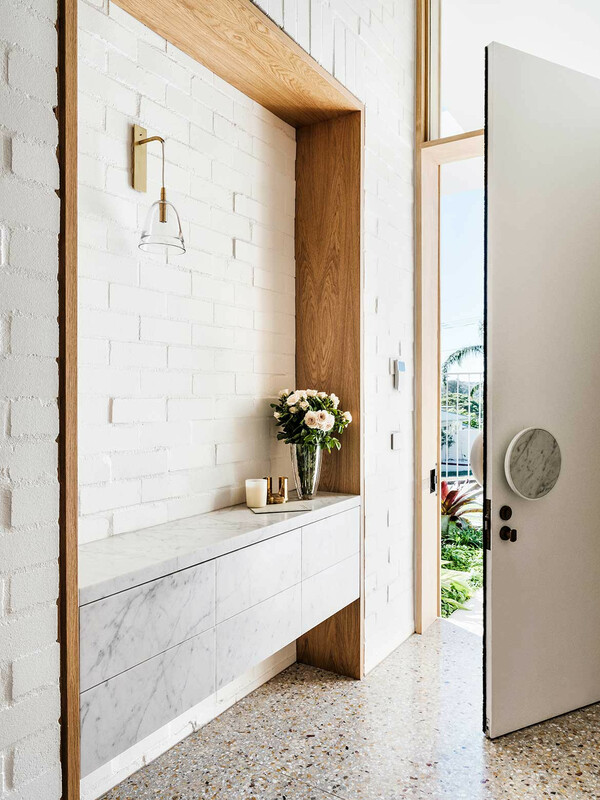 Arashi marble is a graphic and dramatic choice in the master bathroom, and marginally offset white-painted bricks create texture on interior and exterior walls. 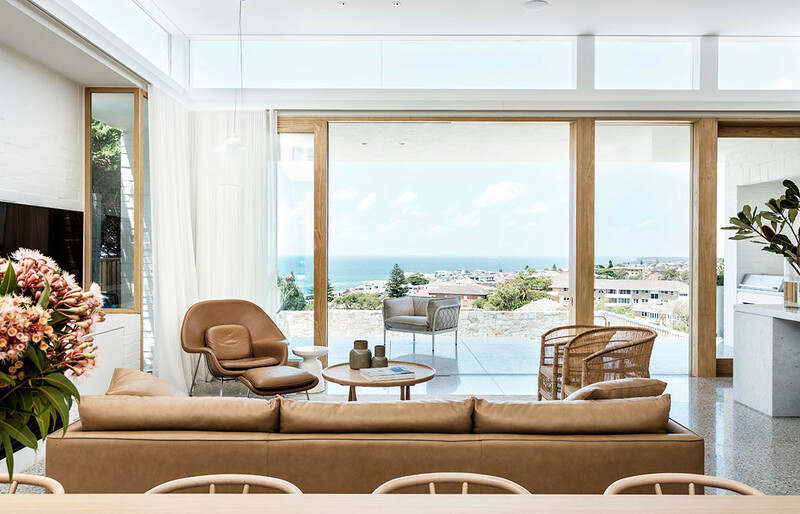 The natural colour of the furnishings is also in harmony with the materials, contributing to the relaxing environment and ensuring attention is on the space, light and views. 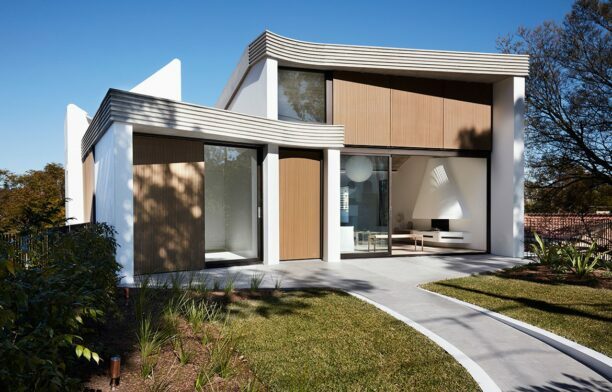 Filled with sunshine, fresh air and open spaces, there is no doubt this house feels good. But more than that it helps the family live better. “The house feels calm and effortless. It’s not doing gymnastics or trying desperately hard,” says Madeleine.